MIMO is increasingly being used to provide improved levels of efficiency in many high data rate technologies including Wi-Fi and other wireless and cellular technologies. Essentially MIMO, employs multiple antennas on the receiver and transmitter to utilize the multi-path effects that always exist to transmit additional data, rather than causing interference. The schemes employed in LTE again vary slightly between the uplink and downlink. The reason for this is to keep the cost of terminals low. There are far more terminals than base stations and as a result terminal pricing is a far more sensitive process. For the downlink, a configuration of two transmit antennas at the base station and two receive antennas on the mobile terminal is used as baseline, although configurations with four antennas are also being considered. The uplink from the mobile terminal to the base station employs a scheme called MU-MIMO (Multi-User MIMO). Using this, even though the base station requires multiple antennas, the mobiles (UEs) only need to have one transmit antenna and this considerably reduces the cost of the mobile. 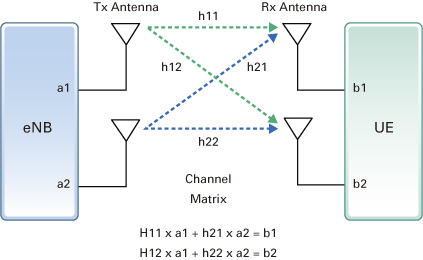 In operation, multiple mobile terminals may transmit simultaneously on the same channel or channels, but they do not cause interference to each other because mutually orthogonal pilot patterns are used. This technique is also referred to as spatial domain multiple access (SDMA).